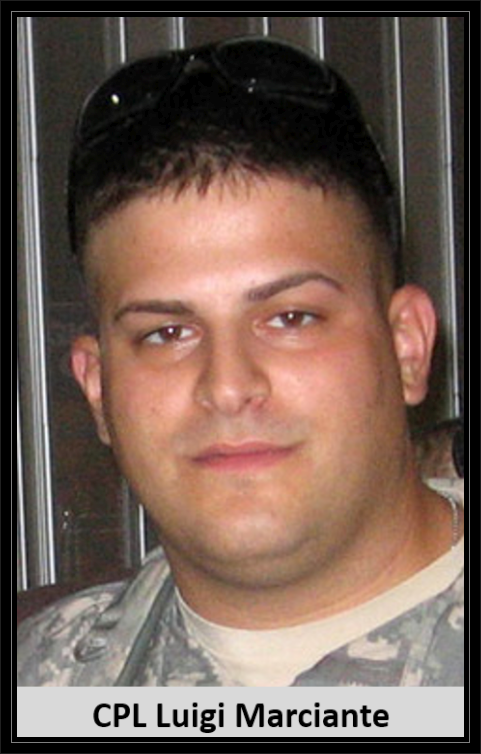 Hometown: Elizabeth, New Jersey, U.S.
Died: September 20, 2007 in Operation Iraqi Freedom. 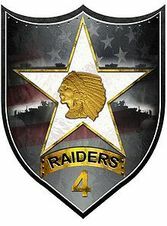 Unit: Army, 2nd Battalion, 23rd Infantry Regiment, 4th Brigade, 2nd Infantry Division, Stryker Brigade Combat Team, Fort Lewis, WA. ​Luigi “Louie” was born November 10, 1981, in Elizabeth. He was a beloved husband, father, son, and hero to all who knew him. He was renowned and cherished for his love of life, sense of humor and uncanny ability to bring happiness to every life he touched. Physically gone but not forgotten, our lives are richer having known him, and his presence will sustain us forever, not only in our hearts but in the eyes of his son. 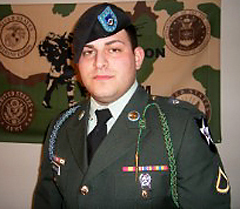 Marciante, a 1999 graduate of Elizabeth High School, had been assigned to the 2nd Battalion, 23rd Infantry Regiment, 4th Brigade, 2nd Infantry Division, Stryker Brigade Combat Team, Fort Lewis, Washington. 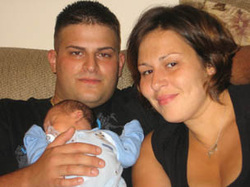 The youngest of four children, Marciante was born in Elizabeth to Luigi and Maria Marciante and was baby brother to Accursio, Ronnie and Enza. He loved club music, and after graduating from Elizabeth High decided to try his hand at deejaying but what Louie longed to become was a cop. His father had been a police officer in Italy before immigrating to the U.S. and Marciante had long dreamed of following in his father's footsteps. The Army seemed like a good place to start. While assigned to Fort Lewis, Marciante met his future wife, Stephanie, a Brick, NJ native who was an Army MP. The couple married in the summer of 2006. When Stephanie was five months pregnant, Louie was deployed to Iraq. He took his new mission in stride, but was keenly aware of the dangers. He longed to be by his wife's side and cherished the regular letters he'd get from friends and family. 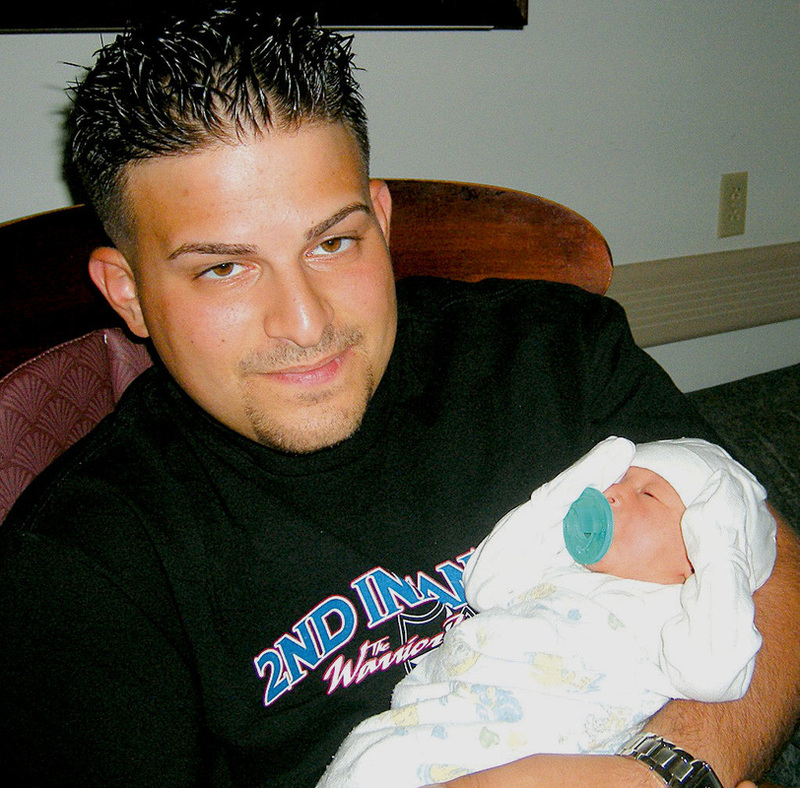 A newlywed four months into his first Iraq tour, Marciante had been given an 18-day leave so he could return home for the birth of his son and Louie soaked in every minute with Lorenzo. When he donned his fatigues again on August 23 for his flight back to Iraq, Marciante could only talk about when he'd be able to return home for good, raise his son and fulfill his dream of becoming a police officer. Louie was a vibrant 25 year old who had an amazing zest for life. Not a day goes by that we don’t miss his laugh, the smell of his cologne or just a telephone call to say, “hi”. We as Louie’s family are tremendously proud of the man he became. We are proud that he wanted a better life and chose to join the Army to achieve that goal. Proud that he was loved by so many people and touched so many lives. But most of all we are proud that he served our country with honor.